In previous posts, we have outlined George William Warren’s engagements as St. Paul’s organist and choirmaster, showing from contemporary sources that he was at St. Paul’s from late 1848 until August 1, 1860, the “nearly thirteen years” at St. Paul’s that he mentions in his letter of resignation[i]. During this period, we know that Warren left St. Paul’s during late 1856 and some part of 1857 when he was organist and choirmaster at Albany’s Second Presbyterian Church. Until recently, however, it has not been possible to say exactly how long he was there. Our only source of this information that he had gone to Second Presbyterian was a November 1856 article in a Boston music journal,[ii] which does not tell us exactly when he left St. Paul’s, or when he returned. The chronology is now provided by a May 1857 article in the Albany Morning Express which announces Warren’s departure from Second Presbyterian: “St. 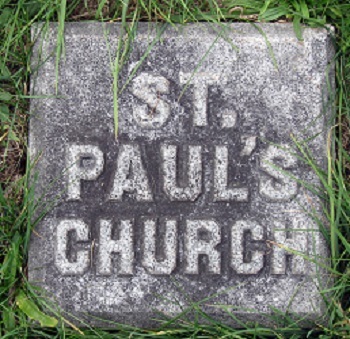 Paul’s Church has finally effected another engagement with George William Warren, who, until last October had been their organist for eight years.”[iii] This would mean that Warren left St. Paul’s in October 1856 and returned (as we know from his letter of resignation[iv]) effective August 1, 1857. This allows us to construct a chronology of Warren’s activities during 1856 and 1857. In an April 1856 advertisement Warren identifies himself as “Organist and Musical Director at St. Paul’s Church (eight years)”. [vii] But sometime during the summer of 1856, Warren decided to leave St. Paul’s. In September, according to St. Paul’s vestry minutes, “George W. Warren account for services as Organist & amounting to $698.77 was present and referred to Messrs. [Edward E.] Kendrick [, John] Tweddle & [Benjamin C.] Raymond with power & authority to adjust the same.”[viii] Almost $700 was a great deal of money in 1856, perhaps very close to a full year’s salary. Had Warren not been paid for some time? It seems likely, but we have no evidence. Whatever the cause, Warren left St. Paul’s during the month of October 1856, and settled into his new job at the church often called “Mr. Sprague’s Church,” in reference to its eminent minister, William Buell Sprague. We first hear of him in his role at the exhibition of a new organ at First Congregational Church in Albany. A major change for Warren at Second Presbyterian was the type of choir. At St. Paul’s, Warren had conducted and composed for a quartet choir, four professional soloists, many of whom (including Lucy Eastcott, Henry Squires and Isabella Hinckley) went on to operatic careers. Second Presbyterian, on the other hand, had a chorus choir, a larger group primarily composed of amateurs. We have only a few clues as to why Warren chose to return to St. Paul’s. He was a member of the congregation, and Mary Eliza Pease, whom he would marry at St. Paul’s in September 1858, was also a communicant. But as the Albany Morning Express suggested in May[xiii], St. Paul’s vestry must have made him an offer impossible to refuse. It is important to remember that, although George William Warren had been a church musician for thirteen years, he had very little formal training, and was not yet thirty years old. Clearly, the year’s experience at Second Presbyterian was an important step in his education. By the spring of 1857, St. Paul’s terminated its contract with Albert H. Wood and the quartet choir effective 20 Apr 1857[xvi], and a month later George William Warren again offered his services to St. Paul’s[xvii]. But even before Warren resumed his duties at St. Paul’s on August 1, 1857[xviii], he made it clear what he learned at Dr. Sprague’s Church. In the classified section of the Albany Evening Journal for June 15, 1857, Warren advertised for “Ladies and Gentlemen with fine voices and fair musical abilities.” Clearly, “St. Paul’s New Choir” was to a be chorus choir. The following year, we have evidence from St. Paul’s vestry minutes that rebuilding the organ and moving the choir chairs were not the only expenses necessary to bring George Wm. Warren back to St. Paul’s. [ii] Dwight’s Journal of Music 15 Nov 1856, page 53. [iii] Albany Morning Express 30 May 1857. [v] “Musical Compliment,” Albany Evening Journal, 7 Sep 1857. [ix] Troy Daily Whig 14 Jun 1855. [x] Musical World, 28 Oct 1854, page 102. [xi] Albany Evening Journal 22 Jan 1857. [xiii] Albany Morning Express 30 May 1857. [xvi] St. Paul’s vestry minutes. 17 Apr 1857. [xvii] St. Paul’s vestry minutes. 26 May 1857. [xix] St. Paul’s vestry minutes. 22 May 1858. This entry was posted in George William Warren, Music on July 22, 2016 by Paul Nance. The South Ferry Street Church: Gothic, or Gothicized?